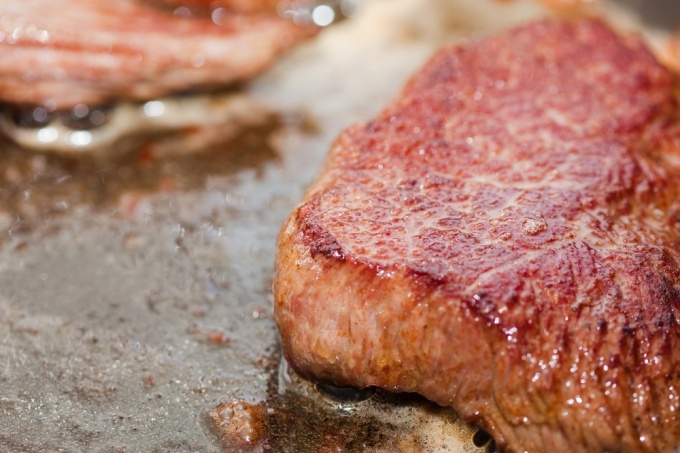 Grill method of cooking a steak by dry heat, which is best suited for well razdelannuyu beef, such as thick edge. Prepared on charcoal, gas or wood, bone, ribeye – perfect for grilling. Ribeye cut from the rib portion of the carcass of the cow where the muscles of the animal involved, the meat is due to this softer and has blotches of fat. Some people believe that steak on the bone is more flavorful, while others prefer meat without bones. Ribeye is one of the most expensive parts of the beef. 1. Prepare coals for grilling, fill half the grill with charcoal, and the other half leaving it blank. Put a bloody steak on a blank part of the grill until medium rare steaks are still cooking. 2. Ignite the coal in accordance with the instructions on the package and let them burn as long as they are not covered with ashes. 3. RUB the ribeye steak with salt and pepper or your favorite seasoning, and place on top part of the grill where charcoal. 4. Do not cover the grill with the lid, turn the steaks only once. 5. Fry steaks without bone thickness of about 2 cm for 3-4 minutes on each side for medium-rare bloody. Pieces of meat with a thickness of 2.5 cm to obtain the average degree of roast need to cook for 5-7 minutes on each side. 6. T-bone steaks 2 cm thick need to fry for 3-4 minutes on each side for medium-rare bloody. For obtaining of medium rare t-bone steaks need to cook for 5-6 minutes on each side. 7. Steaks rare strong make a good choice.